In a post back in March, I noted that the French writer Madame de la Fayette is frequently said to have written the first modern novel--and yet today's writer, "Hélisenne de Crenne," published her extraordinarily popular novel, Les Angoysses douloureuses qui procedent d'amours (The Torments of Love), in 1538, more than a hundred years before La Fayette's La Princesse de Montpensier appeared in 1662. So popular was Hélisenne de Crenne's The Torments of Love that, by 1560, eight complete editions had been published. 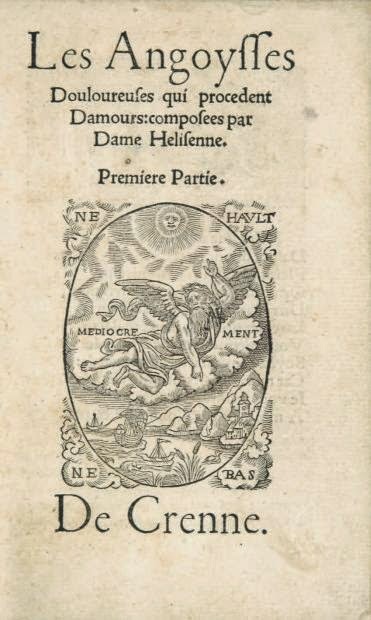 And between 1538 and 1541, she published three other works: Les Epistres familieres et invectives de ma dame Hélisenne (The Personal and Invective Letters of Madame Hélisenne, 1539), an epistolary novel; Le Songe de madame Hélisenne (The Dream of Madame Hélisenne, 1540), a dream allegory; and Les quatre premiers livres des Eneydes (The First Four Books of the Aenead, 1541), a prose translation of the first four books of Virgil's Aeneid. Who was this prolific and popular sixteenth-century woman writer? 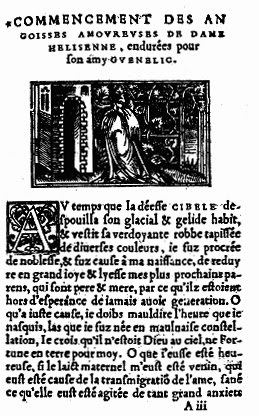 "Hélisenne de Crenne" is the pseudonym adopted by Marguerite Briet, born in Abbeville, Picardy, about the year 1510. Little is known of her life aside from the fact that she married a minor noble, Philippe Fournelle, sieur de Crenne, but her work makes clear that she has received some sort of humanist education--her work demonstrates familiarity with biblical and classical sources as well as her knowledge of Renaissance writers, including Italian writers like Petrarch, Boccaccio, and Jacopo Caviceo as well as a later French contemporary, Jean Lemaire de Belges. There is also a reference to de Crenne in Nicolas Rumet's Historia Picardiae (History of Picardy, c. 1562): "In the year 1540, in the month of May, a learned woman, originally from Abbeville, named Marguerite Briet (commonly called Hélisenne de Crenne), a Gallic poet, lived in Paris at the sign of Augustus." Just four legal documents survive, only one of those offering much personal information, and even that is suggestive rather than conclusive. A document from 1552 indicates that Marguerite Briet is "separated" from her husband and living in Saint-Germain-des-Près. Given the lack of much biographical data, the tendency has been to read Hélisenne's work autobiographically, in particular The Torments of Love, in which a young woman, named "Hélisenne," narrates her own story. "Hélisenne" is beautiful (of course) and happily married (she married at age eleven!!!!) to a young nobleman--until one day her mutually satisfying marriage is destroyed when she looks out a window and sees a young, beautiful, but not noble, man, Guenelic. A great deal of physical cruelty, torment, and despair follows--ultimately, both lovers die, and it is interesting to see how different this story plays out in relationship to Madame de la Fayette's most well-known work, The Princess of Clèves--in which a young and beautiful woman who is happily married to a young nobleman sees and falls in love with another man. But, unlike Hélisenne, the princess does not give in to her passion. And she doesn't die, either, though her unfortunate husband does . . . Even then, however, the princess will not marry the man she loves (and who loves her)--it would dishonor her dead husband. While the exact date of Marguerite Briet's death is not known, the 1552 legal document that makes a series of gifts is dated 25 August--and that's why we know her death can be dated "after" that date.